What happens when the greatest movie automobile legend merges its DNA with an avant-garde watchmaking Maison ? What should one expect from the marriage of time and speed, technical virtuosity and the magic of cinema ? In collaboration with the DeLorean Motor Company, RJ-Romain Jerome unveils a new timepiece in tribute to an iconic Eighties legend – the DeLorean automobile. This science-fiction spiked meeting is giving birth to a limited edition featuring details strongly reminiscent of the spectacular aesthetic of the legendary car. As the central hero of one of the most memorable trilogies in the history of cinema, the DeLorean and its amazing design have fascinated generations of viewers. With its long-lasting materials and reinforced safety measures, the DeLorean car was already ahead of its time when it came out in 1981. With its rear engine, gull-wing doors and brushed stainless steel bodywork, its legendary allure made a huge impression to an entire era. It was RJ-Romain Jerome’s wish that its DeLorean-DNA remains true to the car’s inimitable aesthetic appeal. Entirely made of brushed stainless steel, this chronograph uses the same materials as the original bodywork of the DeLorean car, of which certain elements have been melted together with the steel of the bezel. The dial is engraved with cross-strut traverses picking up the iconic X-shaped design that has become a RJ-Romain Jerome brand signature. The ring surrounding the minute counter at 3 o’clock evokes the original design of the wheel rims, while the hands are inspired by automobile dashboards. The small seconds dial has the same colours and look as the car’s tail-lights. A medallion engraved with a DeLorean adorns the case-back, along with the number of the watch, which is limited to 81 – a reference to the year the car was manufactured. In a final nod to the original model, the strap made of upholstery leather features anthracite grey stitching similar to the interior of the DeLorean car. The DeLorean has remained engraved on collective memory due to its visionary concept and avant-garde design. There are only 6,500 left in the world and a very active community of fans and owners’ clubs has been built up around this famous car. Today, this tribe is joining that of watchmaking collectors for a watch that pays tribute to one of the major legends in the automative industry. 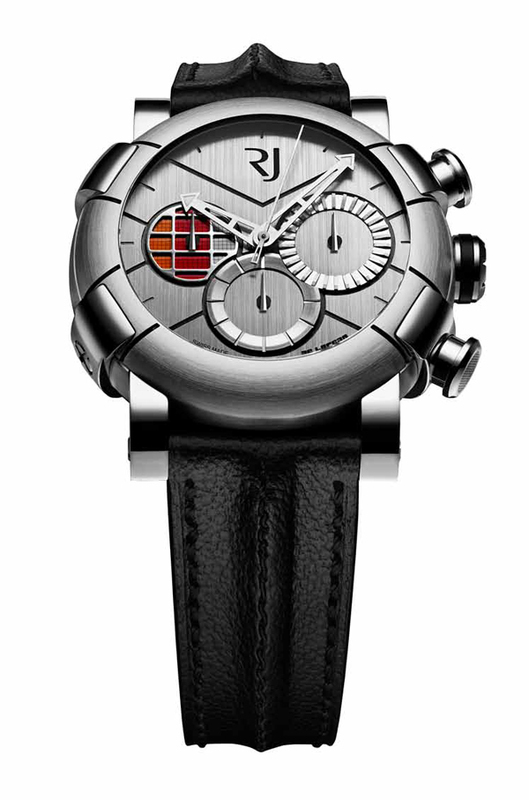 Are you ready for a journey of a lifetime with RJ-Romain Jerome ? Since its debut in 1981 DeLorean has earned its place in pop-culture iconography. The sport cars’ easily recognizable gull-wing doors, stainless steel body, and rear mounted engine has appeared in movies, video games, and television shows. The DeLorean Motor Company (DMC), based in Humble, TX, USA, acquired the original company’s name in 1995 and now owns the largest remaining original parts stock from the factory, US stock and original suppliers. DMC assembles, services, appraises, restores and sells DeLorean automobiles, parts, accessories and merchandise to customers around the world. DMC custom-assembles cars to order, featuring parts or designs from the original DeLorean automobile, with modern engine and suspension technology. A variety of DeLorean products have been developed through licensing relationships with manufacturers in footwear, apparel, toys, collectibles, gaming and other product categories.